I’m proud to announce that the Fleming Center’s healthcare management program is now CAHME accredited. Considered the benchmark that ensures the integrity of healthcare management education, CAHME accreditation is highly sought after by students and employers. Students who select CAHME accredited programs know they will have access to high quality content, great teaching and a network of healthcare professionals that will help them secure jobs in their field. To achieve this honor, the Fleming Center went through a rigorous three-year peer review process, which substantially strengthened and improved our program. Now, we are one of only five M.P.H. programs in healthcare management in the country accredited by CAHME. We are also accredited by the Council on Education for Public Health (CEPH.org). That means we are recognized for excellence in public health and healthcare management. Looking forward, we’ll continue to build on our dual accreditation to attract the best and brightest students, and tap into our active network of healthcare professionals in the Texas Medical Center to offer new opportunities for learning, leadership and fellowships. Read on to discover more about how the Fleming Center is creating leaders in public health and healthcare management. The George McMillan Fleming Center for Healthcare Management draws on the diverse academic and professional expertise of our accomplished faculty and partnerships with world-class institutions in the Texas Medical Center to advance healthcare management education and research. Preparing professionals to meet the unique challenges and changes confronting the healthcare industry is our central mission. Our degree programs provide a solid foundation for managing an interdisciplinary healthcare environment. We currently offer a Master of Public Health (M.P.H.) and Doctor of Philosophy (Ph.D.) in Management and Policy with an emphasis in health management and health policy. Learning from leading experts in healthcare management, our students acquire skills that go beyond the traditional financial and organizational needs of health institutions, to gain a broader perspective covering population health. Graduates are well-equipped for leadership positions in hospitals, public health agencies, pharmaceutical firms and other organizations in the healthcare sector. We also offer a variety of executive education courses for working professionals looking to enhance their healthcare management expertise. Research, real-world cases, internships (practicums) and fellowships give students hands-on experience integrating healthcare management theory into practice. Our students also benefit from our faculty’s extensive academic and professional experience. Many faculty members serve as consultants to industry and offer valuable insight into the inner workings of healthcare organizations. The Fleming Center offers rigorous training in healthcare management paired with a one-of-a-kind focus on population health. We currently offer a master’s degree and doctoral degree in public health with an emphasis in health management and health policy. We also offer a graduate certificate in healthcare management for individuals considering an M.P.H. in healthcare management, but would first like exposure to many of the courses. The M.P.H. in Healthcare Management provides students with a solid foundation for managing in a complex healthcare environment. The program provides training for students with interests in administration and the management of a variety of healthcare environments, including hospitals, public health agencies, nursing homes, health systems, pharmaceutical firms, insurers and other organizations in the healthcare sector. The Ph.D. in Health Management and Health Policy offers training for students who wish to practice health management at an advanced level or pursue academic careers in health management. The program develops researchers who can ask relevant questions, identify answers and drive policy and organizational change to improve healthcare access, quality and cost. The Certificate in Healthcare Management is intended for health practitioners and individuals wishing to increase their knowledge in healthcare management. The five courses in this non-degree program cover the core content of healthcare management. In-person classes are available at the Houston campus and via ITV across other UTHealth School of Public Health Campuses. Most courses are taught in the early evening, allowing working professionals to easily pursue the certificate. A certificate is awarded to students who pass all five courses. The certificate program is designed to be completed in one year. The UTHealth School of Public Health takes a holistic approach to admitting, and is committed to recruiting a diverse and academically qualified student body. Students are considered for admission to the Fleming Center’s academic programs based on multiple criteria including grades in all undergraduate and graduate programs, standardized test scores, academic history, career and volunteer experience, personal statement of goals, and letters of recommendation. Although important in the decision process, student GPA and standardized scores are not the sole basis for admission. Student goals and commitment to advancing public health are also taken into consideration. Please visit the School of Public Health’s prospective students page for more information on admission requirements, tuition and financial assistance. Average student scores: The average GPA for our incoming students pursuing a Master of Public Health degree in Healthcare Management is 3.3. The average GRE score is 155 Verbal, 155 Quantitative, and 4.0 Writing. Students are taught through a combination of lectures, cases and hands-on assignments. In-person classes are available at the Houston campus and via ITV across other UTHealth School of Public Health campuses. Some classes are also available online. Assessments include case studies, field work, essays, short answer tests, class leadership, and individual and team presentations. For specific assessments, and their relationship to each course and competency, please see the course syllabi. Letter grades (“A,” “B,” “C,” or “F”) are given for all M.P.H. core courses. Elective courses may be letter-graded or graded on the basis of pass/fail (“P” or “F”) at the discretion of the instructor. Letter grades in pass/fail courses (i.e., an “F”) will not be included in the GPA calculated for letter-graded courses. A GPA will be calculated from all letter-graded courses. For more information on grading policy, see the latest catalog for UTHealth School of Public Health. The M.P.H. degree program is accredited by the Commission on Accreditation Healthcare Management Education (CAHME). Considered the benchmark that ensures the integrity of healthcare management education, CAHME accreditation is highly sought after by students and employers. 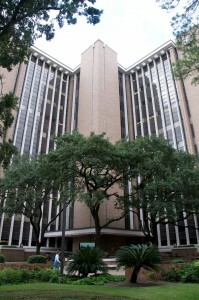 The Fleming Center's healthcare management program is one of just five M.P.H. programs in the country to receive the prestigious accreditation. Our diverse faculty includes researchers, consultants, former executives and current administrators of major healthcare organizations in the Texas Medical Center. Leaders in their field, Fleming Center faculty members frequently publish in prominent journals, serve as officers in national professional associations and organizations, and speak publicly about vital healthcare management issues. Revere directs the Fleming Center and the Healthcare Management program, and teaches quality evaluation and improvement, research methods and proposal development and leadership. Before earning her doctorate in public health, she held numerous leadership positions in the healthcare industry. Revere has authored many works aimed at process improvement, service utilization and costs and innovative instruction for learning. Appari specializes in the economics of health information technology and the economics of health care delivery to priority populations, and teaches doctoral courses on health IT management, and research methods. Before earning his doctorate in business, Appari was principal software engineer with the Indian subsidiary of Honeywell and has held leadership positions in software quality system management. Rigoberto I. Delgado, Ph.D., M.B.A.
Delgado brings more than two decades of experience in operations management, finance and economics to the Fleming Center. Currently, he is the principal investigator for several cost-effectiveness studies in cardiovascular disease, in partnership with UTHealth Medical School. Delgado has worked extensively for biotechnology, software and healthcare companies in the United States and in Latin America. Galeener teaches Introduction to Management and Policy Sciences, a core course in the Department of Management, Policy, and Community Health. She has more than 30 years of systems management experience in the energy industry. After retiring from ExxonMobil in 2000, she earned her doctorate in public health from the UTHealth School of Public Health, and joined the faculty in 2010. Currently, she is editor of the Texas Public Health Journal. Gretchen Gemeinhardt, Ph.D., M.B.A., F.A.C.H.E. Gemeinhardt has an extensive background in the teaching and application of management principles in healthcare organizations. Before joining the faculty of the Fleming Center, she ran a leadership development program for Harris Health System, led education at Memorial Hermann Hospital and taught in Texas Women’s University’s Master of Healthcare Administration program. Trudy Millard Krause, Dr.PH., M.B.A., C.P.H.Q. Krause is the Fleming Center’s content expert on outcomes analysis and claims data research. She has served as a hospital administrator, designed quality assessment programs and tools for health plans, created and managed employee assistance and disease management programs, and consulted nationally on accreditation and certification programs. She co-directs the UTHealth School of Public Health Center for Healthcare Data Research. Langabeer has served in hospital leadership at several renowned academic medical centers, led two technology startup firms through commercialization, provided management consulting to non-profit organizations and is a seasoned researcher and professor. He has published in nearly 75 academic journals, authored six books and generated more than $20 million in funding as a principal investigator. Mikhail founded the Fleming Center and is interim dean of UTHealth School of Public Health, UTHealth senior vice president for strategic planning, and executive vice president of planning for UT Physicians. He has worked for Mead Corporation, Eli Lilly, the Sisters of Charity Healthcare System, St. Luke’s Episcopal Health System, Continental Bank and Mellon Bank, and spearheaded innovative healthcare management and delivery, finance and organization projects. Morgan leads the Department of Management, Policy, and Community Health and is an affiliate investigator at the Houston Center for Quality of Care and Utilization Studies. He has studied health system outcomes for more than 30 years, and teaches courses on healthcare payment systems and policies, health survey research methods, health services delivery and performance, and proposal development. Pung began her career in nurse executive roles, and expanded her administrative expertise in private, public, academic, and proprietary health care systems over the past 30 years. Currently, she teaches at UTHealth School of Nursing, and has worked with UTHealth School of Public Health as lead for the Nursing Leadership Institute. Juanita Romans is president and founder of The Romans Group, a private consulting group providing strategic, tactical, and operational planning to domestic and international healthcare providers, organizations, institutions and foundations. During her 40 years in healthcare, she’s held positions from clinician to healthcare administrator, including serving as CEO of Memorial Hermann’s Texas Medical Center Operations. Romans facilitates business development efforts for the Fleming Center. Schroth leads the Fleming Center’s executive education programs focused on leadership. She holds a doctorate in public health from the UTHealth School of Public Health, and joined the faculty as a part-time professor in 2010. Previously, she served as executive vice president of The Methodist Hospital System and chief executive officer for Methodist International, Southwest Memorial Hospital and Memorial Hermann Hospital. Wells joined the Fleming Center in 2015 and is co-director for the Center for Management and Policy in Population Health. Her research focuses on cooperation within and among safety net providers. She has been a lead investigator on studies funded by the National Institute on Drug Abuse, National Cancer Institute, National Institute of Mental Health and the Robert Wood Johnson Foundation. Click here for faculty CVs. The Fleming Center offers students many activities emphasizing leadership, teamwork, and learning from industry leaders, further enriching their academic experience. A student organization focused on leadership and management, The Board seeks to enrich students academically, professionally and socially as they transition into their careers. The organization offers course selection help, peer to peer coaching, alumni networking and opportunities for involvement in professional organizations including the American College of Healthcare Executives and Healthcare Financial Management Association. The Board also sponsors career development workshops, and provides activities that encourage students to forge relationships with their peers and successful professionals in their field. Is the investment in health information technology paying off? Healthcare reform: Are we asking the right questions? Will improving healthcare quality save money? The Fleming Center’s annual case competition, co-sponsored by The Board, provides students with an exciting way to apply what they have learned in the classroom to a real-world problem. Teams of students compete to develop the best solution to a healthcare management-related case study. In the process, they bridge the academic and practice worlds, collaborate with their peers and take on leadership roles in a competitive setting. Last year, eight teams from seven universities participated--five from schools within Texas. Teams from UTHealth School of Public Health routinely take top honors in the competition. Fleming Center students also participate in case competitions sponsored by the National Association of Health Services Executives and Medical Group Management Association. Course description: Participants strengthen their ability to lead and manage the tripartite mission of academic medicine: delivering quality clinical care, teaching future physicians and innovating through research. They learn to analyze their organizations and think strategically; plan, communicate and implement change, hone their personal leadership style; and identify, plan and operationalize a strategic project. Format: Available to healthcare organizations. Course is customized to fit the organization that requests it, and the number of class sessions may vary accordingly. Course description: This course empowers chief nursing officers and senior nurse leaders to manage complex healthcare settings. Participants learn to analyze their organizations and think strategically; plan, communicate and implement change, hone their personal leadership style; and identify, plan and operationalize a strategic project for individual departments. Format: Nine-week hybrid course focuses on group training and is available to requesting healthcare organizations. Course is offered in partnership with the University of Houston College of Technology, and meets half of the time in a traditional face-to-face classroom environment, with the remainder of the course delivered electronically. The Healthcare Management Program’s mission is to prepare early and mid-career professionals, in Texas, the nation and the world, for leadership positions in health systems management and policy. Our program promotes the mission of the School of Public Health by delivering the latest training in management and policy theory and practice related to a range of settings including hospitals, health systems, government, public and private payers, and community-based organizations. We provide students with grounding in population health and competencies needed to manage and critically evaluate existing programs and services in these varied settings. This is achieved through an educational process that exposes students to classroom instruction, research projects and practice experience. To be the premier health management program in the Southwest recognized for academic rigor, breadth of faculty expertise, Texas Medical Center resources, and orientation to population health. In addition to the values of the public health profession, the HCM faculty and students are committed to the following statement of values and expectations that are essential to our achievements and to maintaining our recognition as a top-ranked program in health management. We believe in the interdependency of policy, management and community benefit for enhancing the health of populations we serve. We recognize the complexity of health and value the integration of research, teaching and practice in the pursuit of a more efficient and effective healthcare system. We provide a broad range of active learning models that promote creative approaches to address complex health issues. We advocate faculty and student diversity in academic background, professional knowledge, life experience, and career aspirations to reflect the populations we serve. To learn more about the Fleming Center, email us at flemingcenter@uth.tmc.edu or call 713-500-9199. "When I decided to pursue a Ph.D. in Health Management and Policy, UTHealth School of Public Health was the obvious choice for me because of its location in the epicenter of one of the world's largest medical centers. I had confidence in the Fleming Center's ability to connect our didactic education to cutting-edge policy, health management and scientific leaders." Debra F. Sukin, M.H.A., Ph.D.
"Being part of the MPH program in Healthcare Management at the UTHealth School of Public Health was a great experience. Professors are truly involved in teaching, they have experience in the field and they take time to show the importance of the topics beyond the class. I made good friends who share the same interests and help me now in the work environment with their advice and guidance." Luis Garcia Morales, M.D. M.P.H. "I wanted to go to a school where my professors would know me by name and not just as another student. From being a team leader for the Fleming Center's case competition, to interning with the American College of Healthcare Executives, I have the faculty to thank for guiding me and assisting me in my current success." "Even though I am yet to graduate, I am already seeing how my education will enhance my career in healthcare management and policy. The flexibility I have had to explore opportunities outside the school culminates in gaining real-life experiences globally, and enriching my career path." HOUSTON – (Nov. 22, 2017) – The Master of Public Health in Healthcare Management degree program at The University of Texas Health Science Center at Houston (UTHealth) School of Public Health has become one of just five M.P.H. programs in the country to receive prestigious accreditation from the Commission on Accreditation Healthcare Management Education (CAHME).Read more.